Recently an excellent article by my colleague Gayle Meredith was featured in the CoreNet industry magazine - Insite. The article offers practical tips for tenants considering subleasing their space. Here's the intro to the article. 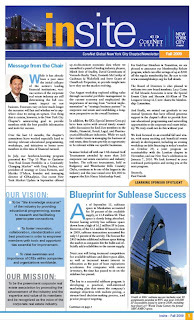 For the full article with great tips on Sublease strategy, click here. As of September 15, sublease space in Manhattan accounted for 30 percent of the available supply, or 15.8 million SF. That space is slowly being absorbed. Recent leasing activity has sublease space down from a high of 16.2 million SF in June. However, of the 12.2 million SF leased to date in 2009, sublease transactions accounted for only 15 percent of the activity. The forecast for 2010 includes additional sublease space hitting the market as companies bite the bullet and officially add availabilities to the current supply. Next year will bring increased competition for available sublease and direct space alike, as well as increased tenant interest in relocation as the pace of lease expirations accelerates. For companies with excess inventory, the time to sit on the sidelines has passed. The key to a successful sublease program is developing a practical, well-informed marketing plan that meets the company’s strategic objectives with realistic pricing, a stream-lined decision-making process, and precise prospect targeting.